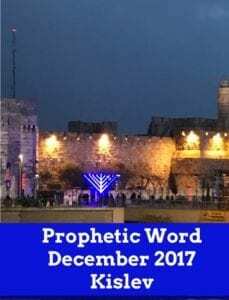 This is the prophetic word for the month of December 2017 which is the month of Kislev on the Jewish calendar. This month is about TRUST and HOPE and looking for the LIGHT in the midst of darkness. In the Torah we find that the root of the word Kislev means ‘trust’ and ‘hope’. The 9th month of the Jewish year, corresponding to December. The word is found in Nehemiah 1:1 (which starts the rebuilding of the temple) and Zechariah 7:1. This month is best known for the holiday of Hanukkah or Chanukah, which begins on the 25th of Kislev/December 12th and runs over into the next month which is Tevet. The message of Chanukah is the eternal power of light over darkness—good over evil. Aside from commemorating the miraculous victory of the small and militarily weak Jewish army over the mighty Syrian-Greek empire, on Chanukah we celebrate the miracle of the oil. When the Jews sought to light the Temple menorah after the war, they found only one small jug of oil that had not been defiled by the pagan invaders. Miraculously, the one-day supply burned for eight days until new pure oil could be obtained. This month has the darkest day of the year. It is the winter solstice. When our days are dark and cold, there is the possibility that people develop depression attributed to the diminished sunlight of Winter. After the Winter Solstice, the glimmer of light that arrives really does spark in us a trust in a brighter future. So in the midst of the darkness there is a celebration of the Light. Here’s an interesting fact, the first rainbow, observed after the Flood, was seen in Kislev. “And G-d said: ‘This is the sign of the covenant which I set between Me, and yourselves, and between every living being that is with you, unto eternal generations. I have placed my bow in the cloud, and it shall be a sign of a covenant between Me and the Earth.’ ” “This is the sign of the covenant” – G-d showed Noah the bow and said to Him: “This is the sign of which I spoke” (Genesis 9). Another interesting thing about this month is that it is called the month of dreams. God speaks to His people using dreams. Isn’t it interesting that one of the most famous dreamers in the bible, Joseph, was given the coat of many colors by his father? Like a rainbow! Spend some time this month reflecting on the miracle of the 1 day of oil lasting for 8 days and realize that you are in a season of the miraculous. Believe for the miracles. There are things that are right in front of your face, you already have them but you need new eyes to see what you have. Ask God to show you what you’ve been missing all this time. You need to see it with new eyes. Opportunities that can only be seen with new eyes. This is why you need to Light to see past the darkness. This is powerful. Very deep and insightful. I have been uplifted by the word of God and direction given. Am blessed. i have been following ministries online since 1998 but nobody has explained it in such simplicity, straight to the point and ‘prophetic’ in every sense, By God’s grace like your ministry. It is clear you are not in a hurry to publish and there is years of learning and experience behind your messages. Surely, a believer can find much resources here to grow spiritually. God bless you! I came to these posts at an Appointed Time. This is a blessed ministry of Truth! Keep moving and stay faithful! I agree! 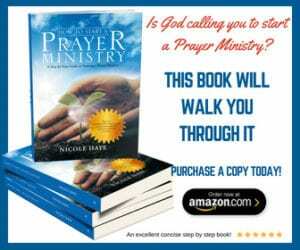 Your site is a true blessing to all of us! Thank you for all your hard work and love! God Bless you and all who come to revive!